The nights are drawing in, and this weekend the clocks go back. Now it's time to think about floodlights on Lady Jane, so I can continue working on deck when it's dark. I've thought long and hard about floodlighting, and opted to go down the low energy floodlighting route. 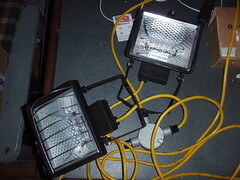 I've chosen the low energy floodlights simply because I can run them from the battery bank anytime I want. I have no worries about the amount of power they drain, as the wind turbine will easily be able to keep up. I've yet to mount my forward deck floodlight, but have finally made the decision to take down the working 110V DC deck floodlight from above the wheelhouse and replace it with a low energy floodlight. The difficulty, in my head, being I'm doing away with a perfectly serviceable floodlight, though in truth it can only be used when either the main or donkey engines are running. I had a similar issue with cannibalising the tripod the two 500W floodlights, which you can see in the picture, were mounted on, in favour of one low energy floodlight, but that's done and I'm pleased with the result. Now I have a portable floodlight that I can use almost anywhere without being concerned about power consumption. (26 Watts versus 1000 Watts). I also have an old, but very sturdy, camera tripod which I'll try and mount a third floodlight on, this will then be used mostly below decks as a replacement for my leadlight, which I've never been happy with. In power consumption versus light produced I'm definitely gaining. In available light to work by I'm slightly down, but not by any really serious amount. After trials, at 26 Watts the low energy floodlights put out an impressive amount of light. Certainly more than enough to work by. I realise though that I won't be able to make toast by them, unlike the pair of 500W lights, but then I've a toaster on board for that. The trolley has now been commissioned and it passed it's initial test with flying colours. The next test will no doubt be Robin's close inspection of my welding which, even though I say it myself, is pretty damn good! Here you see it earning it's keep already, with yet another load of stuff for the boat. I can already see that this is going to be one of those times where I'll be thinking 'why didn't I do this sooner'. I did start work on a drawbar, but wanted to do some trials to see how it handled first. Unsurprisingly it handles like a shopping trolley, so maybe I'll switch the back wheels to fixed wheels rather than castors. If I do, I'll will loose the turning capability, which I quite like on the confined dock. Shifting loads like you see is effortless except, I've discovered, when trying to cut through a sandy bit. The wheelhouse ceiling has been the latest victim in the quest to seal the boat from the elements, as winter and it's accompanying wet and windy weather will soon be here. 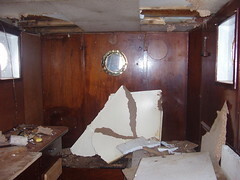 I've known there were holes in the wheelhouse roof for quite some time, but have not worried about it so much as I thought they were fairly insignificant. 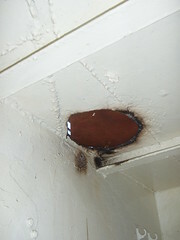 Fixing the holes in the steel presented no major problems, asides of course for the necessary damage to the ceiling. For some strange and unfathomable reason, the front and part of the roof section of the wheelhouse is made from aluminium (aluminum for you guys in the US), which is riveted to the steel section behind and below. You can see the join line in pictures of the outside of Lady Jane. Anyway, since a portion of the ceiling had to come down anyway I investigated the leak in the aluminium part of the roof a little further. It turns out, assisted by a convenient rainstorm, that the joint in the roof between the aluminium and the steel in the roof is leaking quite a bit more than I thought. This explains why the wheelhouse deck is rusted so completely through to the outside, where it overhangs the deck. It would be bad form to loose one's skipper through a rusty bridge deck, so obviously I need to fix this. That will also help protect my precious new paintwork below. Lady Jane has been a hive of activity this weekend, with most of the focus on getting the wheelhouse block sealed and painted. 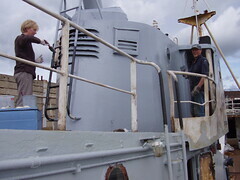 Here are Pat and Fred hard at work painting the rear of the wheelhouse. You can see Fred going grey before your very eyes, though it's not age that's doing it to him. It makes such a difference seeing Lady Jane finally emerging from behind the patchwork of colours and rust which I've become so accustomed to seeing over the last year and a bit. I often find myself thinking 'why didn't I do this sooner?'. The reality is that I've put a lot of work into providing the infrastructure that now makes the painting possible, and have spent a lot of time learning for myself exactly what needs to be done in the battle against the rust. Remember the footings? Wow, I see I made that entry in February. I'll need to re-visit them and finish them off properly now I know so much more. I also enjoy the benefit of Fred's steady progress, chipping away at the rust on various parts of Lady Jane in advance of rubbing down, priming and painting. Without this extra motivation, I very much doubt I'd have achieved even half of what we have done in the last few months. I've had several people, including Rik, who has an excellent blog over at Garfieldt's blog, ask me why I'm putting more weight into Lady Jane. On the face of it, adding weight to the boat doesn't make sense. However the driver behind the ballast is to get Lady Jane's trim correct. If you look at this fairly recent picture of Lady Jane (click on it for a larger image), you can clearly see the line made by the muddy water in Fareham creek, and the horizontal line of the rubbing strakes which run down the length of Lady Jane. These lines show roughly how Lady Jane sits in the water at the moment, compared to how she should sit. Lady Jane has had masses of material removed from her. 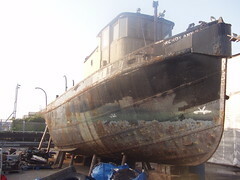 According to the previous owners, they took off roughly thirty five tonnes of steel and concrete when they had her. I must have subsequently removed at least another five tonnes so, although I've got tonnes of ballast to go in, it's nothing compared to the overall weight she has lost. Almost all of the weight removed was from forward of the engine, which is a huge lump fairly far back down the length of the boat, this has had the effect of bringing the bow up and lowering the centre of gravity. The first being that everything on the boat is at an angle when Lady Jane is afloat, making things a little uncomfortable - sleeping for example. The second being it is hard to see over the bow from the bridge, making skippering Lady Jane in confined spaces that much more difficult. The final reason is that with the stern so low in the water, the propeller will tend to push Lady Jane slightly upwards as well as along, wasting fuel and therefore money. The ballast right down in the bow of Lady Jane will lower her centre of gravity, making her even more stable in the water, and, along with the anchor and winch to be installed, will fix the trim issue. In the future, when I build forwards, I also have a several tonnes of water in a bow storage tank which I can use to compensate the trim. If need be, I can also move, or remove, the ballast I've put in as it's all in small, manageable, blocks. Work on the new trolley is almost complete. It's turned out a little heavier than I expected. We have been having pretty poor weather in recent evenings, this has slowed down production dramatically. The idea of grinding or welding inside a garage loaded with petrol for the rib and paint for Lady Jane just does not appeal to me, for obvious reasons. As Dirk suggested, the sides are removable. 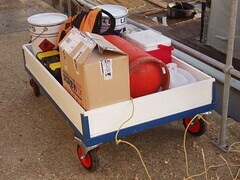 The wheels also have brakes, which should help make loading and unloading stuff easy. All I have left to do on the trolley is a little more welding, some grinding then finally painting. Probably another few evenings worth of work. This has been a homework project for me, for all sorts of reasons, though I'll need to think carefully about doing any more homework like this, as it's quite noisy work and maybe a little unfair on the neighbors. I've added another tonne of ballast to Lady Jane. This is what a tonne's worth looks like, stacked on the quay. I've now loaded nearly three tonnes of ballast, about the weight of two compact cars, into the depths of Lady Jane's bow, but have still only made about 5 or 6 inches difference in her trim. It was on my mind to arrange the blocks in an artsy manner for a cool blog photo, but after carting the stuff about the yard I was in no mood to do so. Ok, so I'm not alone in the 'it would be nice to have a boat, let's buy one and do it up even though I don't know what I'm doing' stakes. 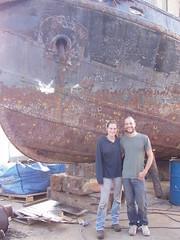 This is Becky and Seb who are the proud owners of Wendy Ann 2. An ex tugboat with what sounds like an interesting history. They are planning on using theirs purely as a houseboat, so have an advantage over me in that they do not need to be concerned with the engine or any kind of boating qualifications. The little yellow marks you can see on the sides are the hull thickness readings, some of which read zero! Good luck to you both Seb and Becky, it's a great adventure. Keep in touch. Hauling all this ballast around to the boat has prompted a new creation. 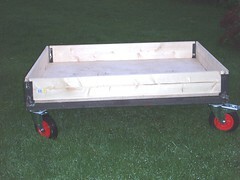 I have now started work on building myself a trolley , which I can use to wheel all this heavy stuff about the place. It's not just the ballast, there always seems to be stuff to cart between Lady Jane and the truck, or from Lady Jane to the skip. The basic frame is now welded together and I have castor wheels on order, hopefully they will be delivered in the next few days. 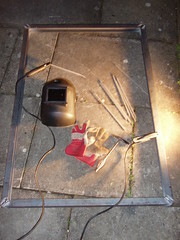 Next I've got to weld the uprights on, these will hold the wooden sides in place. I'll get the wood for the base and the edges once I have everything else welded together and the wheels bolted on. This is mainly so I can accurately measure up the sizes I'll need. I don't know why I didn't think about this earlier. Needless to say, the new trolley will be blue. Hmm, I've had to take a bit of a step backwards. This, that you can see, is a hole I've cut into the roof of the shower room. To do this I've had to take out the shower fitting and all the associated plumbing. This is because all the piping and fittings were plastic and I did not want to risk melting any of it when cutting the hole. I know I could have put a bucket of water up there when cutting with the oxyacetylene, but better safe than sorry. There was a vent up there, but it had rusted almost completely away. For now, I'll simply weld a piece of plate over the hole and see how I get on. This will also mean that once the galley vent has been repaired, painting on the back deck can finally start. If condensation becomes an issue, I can always replace the vent sometime in the future. I will also weld some much needed new metal in the skirting of the shower room at the same time, as the metal there has rusted away quite badly. Anyway, the plumbing is not too hard to replace and I can finally plumb in my much needed new sink at the same time. After re-painting, putting up new shelving and the new mirror, which has been floating around for a while now, work in the shower room will finally be complete - for now. Do you have days where you are busy the whole day, but have nothing much to show for your efforts? I've had one of those days just recently. The reality is I spent the day preparing for painting, mostly cleaning up where welding has been done, or cutting and grinding off odd bits of metal that were sticking out all over the place. The bits that were sticking out are the remains of structures cut off, but not cleaned up, by the previous owners. There are plenty more of these odd 'protrusions' to get rid of. I'm just dealing with the worst, or most dangerous at the moment. 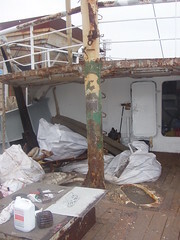 For example, the bottom part of the mast has now been cleaned up, though there is still a little more work to do on this. It was getting late and I was physically too tired to finish off wire brushing the remainder of the bottom of the mast in preparation for painting it. Hopefully I'll get a break in the miserable weather we have been having recently, so I can get on with some serious painting over the weekend. 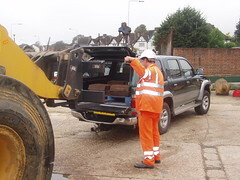 Mark guides Robin in the digger as Robin eases the forklift attachment into my truck to remove another load of ballast for me. 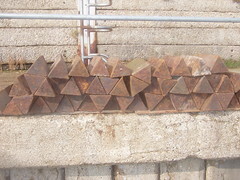 Each one of those triangular blocks of iron weighs 18 kg's (about 40 lbs). I've added 1,764 kg's (4,000 pounds) of the toblerone shaped ballast into the bow of Lady Jane, right down in the bottom of the boat for increased stability. 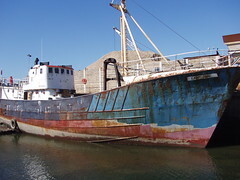 The sad fact is that one and three quarter odd tonnes of ballast has only brought Lady Jane's bow down a few inches. I reckon the bow needs to come down at least a foot. I sit here completely exhausted and covered in bruises, as maneuvering that ballast in the confines of Lady Jane's bow is not easy, thinking I've got to do at least another eight tonnes of this stuff. Oh yes, and at £200.00 (US$ 350.00) a tonne, this is not a cheap form of exercise either. Good weekend weather meant it was time for some fun for a change, so Dale and I went fishing. Here you see the rib being recovered from the Solent after a day's zooming around on flat calm water, interrupted by spells of fishing. 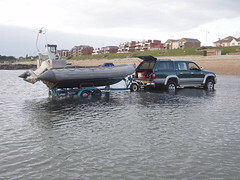 A combination of low tides and a flat piece of slipway, boat ramp for you guys in the US, ensured I had to reverse the truck halfway into the Solent to recover the rib. Even then I had to winch the thing all the way up the trailer. No fish died in the making of this picture, though a few did get fed.